Ambassador Foley has had an extensive career in both the public and private sectors. 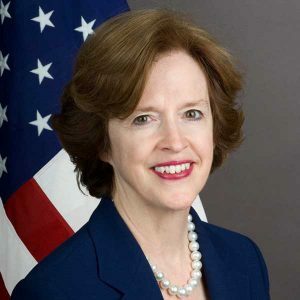 April H. Foley served as the United States Ambassador to Hungary from 2006-2009. She has been an Independent Director of Vista Outdoor since January 2015. She has also been a Director of Xerium Technologies Inc. since May 25, 2010. to serving as US Ambassador to Hungary, she worked at the Export-Import Bank of the United States. After first serving as a Director of the Bank, she was appointed to be First Vice President and Vice Chairman in 2003. Ambassador Foley drove the creation of the Trade Bank of Iraq, securing a $2 billion short-term credit facility. She was one of six Americans on the American-Iraqi Joint Economic Council, which laid plans for strengthening the economic performance of Iraq. Ambassador Foley worked with the Minister of Finance of Afghanistan to create a development strategy that laid the groundwork for foreign direct investment. As a Director, she chaired the Audit Committee and implemented Sarbanes-Oxley processes for the first time, bringing much-needed transparency and accountability to the Bank. She worked for 17 years as an executive for PepsiCo in roles including strategic planning, financial management, and mergers and acquisitions. She holds a B.A. from Smith College and a M.A in Business Administration from Harvard University.